Dubai, United Arab Emirates, November 06, 2018: Al-Futtaim Toyota is ringing in the New Year festivities early with the launch of its “Celebrate 2019 Now” campaign, inviting customers to celebrate the New Year by treating themselves to special deals on a select range of SUV models, coupled with complementary four-year or 80,000 km service contracts. Customers looking for the ultimate in off-road ability and urban presence can choose from the 2019 Land Cruiser 5.7L GXR, 5.7L VXR and the newly introduced Grand Touring edition. While those looking for a great family SUV, they can opt for 2019 Prado providing them ample space and comfort. Also, part of the promotion is the proven 2019 Fortuner, as well as the iconic FJ Cruiser. 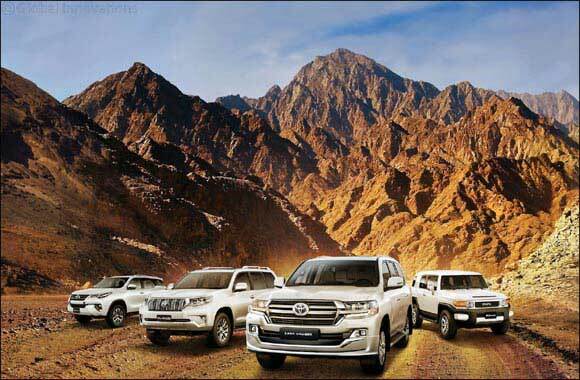 “At Al-Futtaim Toyota, we always strive to give our customers the best family vehicles that are known for their unbeatable value, bullet-proof build quality, durability and reliability. With this campaign we are inviting our customers to start 2019 in style and take advantage of these special offers across our popular SUV range,” said Saud Abbasi, Managing Director, Al-Futtaim Toyota.